I am deeply grateful for the honour of being invited to lay a wreath in memory of George Eliot, and to lay it in a place that meant so much to her.... Nuneaton. 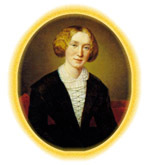 Before the heavens opened, I pictured us all gathered outside surrounded by green grass, trees and flowers, and able to imagine the spirit of George Eliot not in her study surrounded by books but out-of-doors, enjoying the fresh air. Some imagination is needed to visualize a little girl gathering flowers in the sunshine, or running towards a Round Pool after her older brother, or leaping with delight as she caught her silver perch in the Coventry Canal. But in spite of our enclosure within four walls, can we still reflect on 'George Eliot in the Open Air'? 'Tempted to walk all day .... ' The picture of Marian Evans out -of-doors with the wind in her hair is a picture we more readily associate with Emily Bronte than George Eliot, but her love of the open air is apparent not only in Switzerland but also in the Scilly Isles where we find her striding out in 1857 and delighting in what she describes as 'a sense of freedom in those unenclosed grounds'. It is not difficult to link this feeling of liberation with the success of her first fiction and the joy of her loving relationship with Lewes. The weather was often wet and nearly always windy, but the energy of love infused her delight in the shapes and colours of the rocks, her feeling of exhilaration when the wind was at its height and she could see 'the white foam prancing round the reefs and rising in fountain-like curves above the screen of rocks'. Together, they looked up at fountains of foam towards a sky alive with larks. She wrote: 'I never enjoyed the lark before as I enjoyed it at Scilly'.